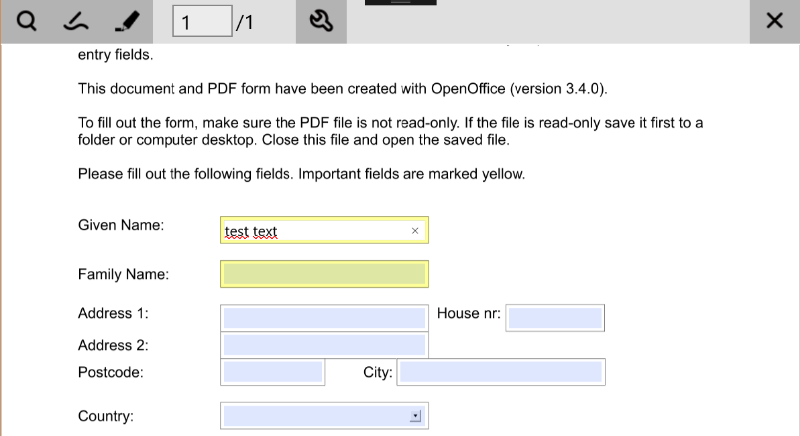 I just tested a PDF Form in PDF Viewer fpr UWP and the Checkboxes were saved when klicked, but when I enter some text in a textfield and leave the field via clicking outside, selecting another field or pressing the return key the text instantly disappears as if it wasn't saved to the variable of the field. Also, when ther was a predefined text in the field, I changed the text and left the field, the changed didn't take effect. The predefined text returned. My question is simply before buying my next license if anyone can definitly say that this works with a maybe formated pdf that the veiwer can't handle and it definitly works on that pdf. Or that it ist knowen that the viewer has problems with this feature. 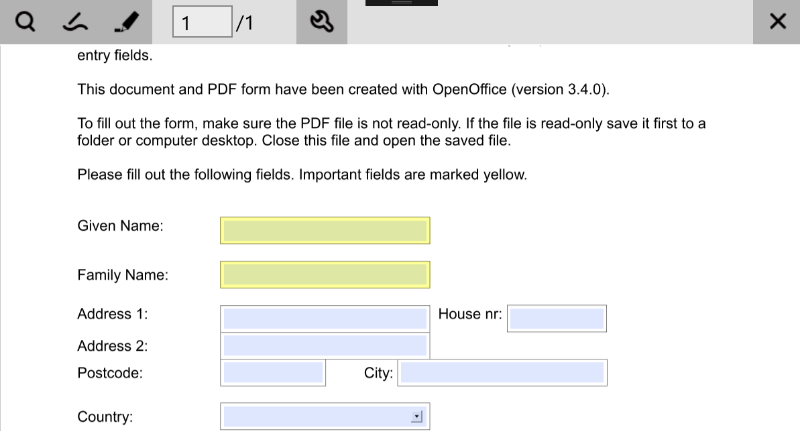 If a correct formatted pdf works, as it works in android and ios version, do you have an example pdf, so I may test it? This is not an issue, this is the default behavior of the demo project. The text is confirmed in the form field when you click Enter or Tab buttons, otherwise it's considered as cancel action. I even tried to assign some text directly to mAnnot.EditText, but EditText ist alwas empty, even when doing a debug output directly after saving. I have attached some screenshots to clarify what I tried. 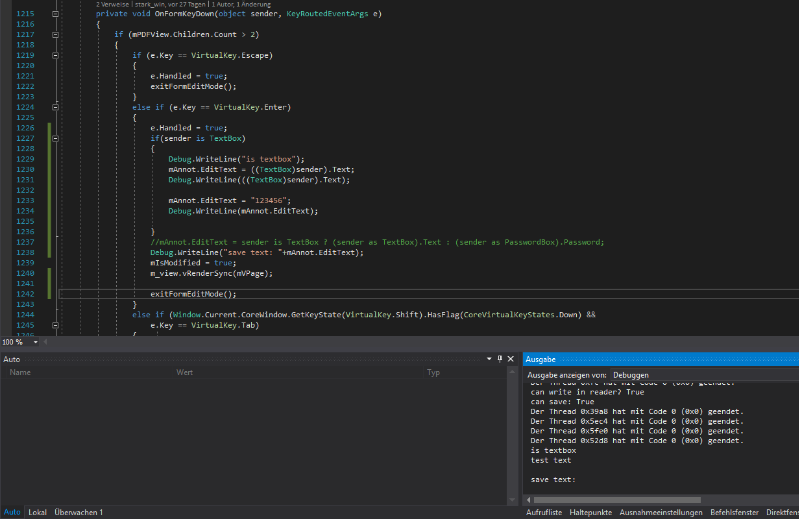 In one screenshot you can see the code I added and the debug output. I also tried two different psdf to be sure its not an error in the pdf. I hope the screenshots help a bit. Can you please retry using the latest demo project ? We cannot reproduce your issue using the demo project. ok, I checked it. It works in the original demo project. But I added the RPDFLib Project to my own project and and added the classes I need to open an pdf from the PDFViewerSDK_Win10 project to my main project. And in this constellation it seems that I cannot assing any value to the PDFAnnot class. Here is another example I tried in the PDFReaderPage.xaml.cs in the method onSingleLineForm. Just to test if I can only asing a value to PDFAnnot.EditText or PDFAnnot.PopupLabel. Every debug output just returns an empty string. I know the PDFAnnot class is public and also the variables and that I would anyway get an error if I tried to assing a value to them and they werent, but I dont understand why it isnt working. I am pretty sure it is a dumb mistake I make, but I tried for some hours now and dont have clue what is wrong. Maybe you instantly know what might be wrong, wiith this new information. If you think this might be a bigger issue I would also be willing to pay for a solution, but hopefully its just a minor thing. Thanks again for your effort I really appreciate it. The main reasons for the setting not to work are the premium license is not activated correctly or you are not openening the file in a write mode.